WHAT'S NEW WITH IAABO CAMDEN BOARD 34? Visit the Photo page for more recipients and photos from the banquet! Board 34 members Billy Martin and Tim Malloy have written, The GameTracker Journal, an innovative tool that provides a template for every basketball official, at every level, to create your own realistic referee roadmap that will help guide you to your desired officiating destination - one game at a time. 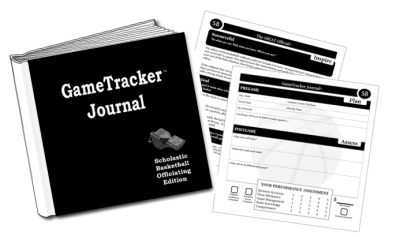 For more information on The GameTracker Journal, click on the REF 60 link below. Hall Of Fame coach Bob Hurley of St Anthony's on Showtime documentary whispering pleasant thoughts to Board 34 referee Scott Sagan.